Guest post by Vishan Guyadeen, Neptis Foundation. Neptis is one of the collaborating partners of the Canadian Historical GIS project. The age of data is upon us. Data from different fields, quality, and types have become more and more available. However, in many cases it can be hard to glean valuable information from data because one might not be able to easily visualize and/or compare it with other datasets. In studying the forces that make up and shape urban regions, it is particularly difficult to contextualize data since it exists in many different places. The Neptis Geoweb is an interactive mapping and data visualization platform that aims to address this issue. 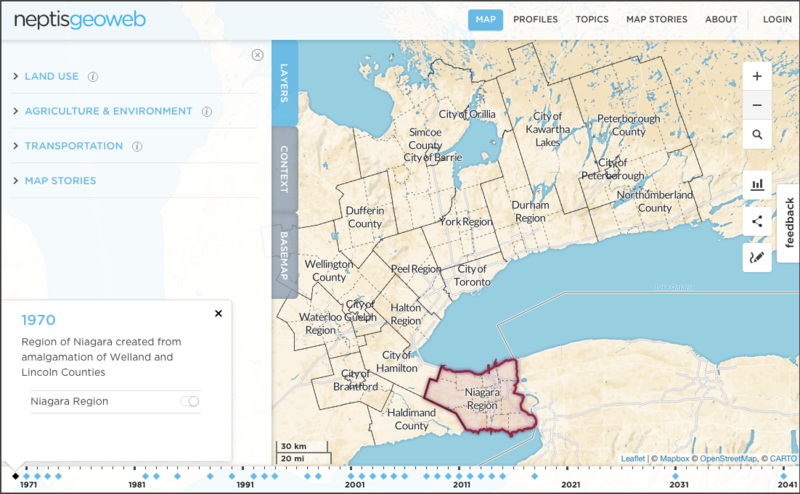 Specific to the Toronto region, the Geoweb utilizes data that is normally siloed in various government organizations to make the complex policies shaping the region more accessible and easier to understand. One subject that requires data that is often difficult to obtain, understand and visualize is the history of the Greater Golden Horseshoe. The Neptis Geoweb has a unique feature – the Timeline, which guides the user through milestone policies/events that have helped to shape the region into its current state. The Timeline is an interactive feature that describes and visualizes milestones in the regional context. Users may also compare these historical map layers with other current and historical datasets for further context. Creating a platform that is capable of showcasing and managing large quantities of data is not an easy undertaking. The Neptis Geoweb was built with a fully customized framework, which allowed for easy access, clear and up-to-date data, as well as the ability to maintain different types of content (e.g. maps, charts, and text). There are two main underlying components that make this possible. First, the most important component of the Neptis Geoweb is Carto (formerly CartoDB). Carto is a cloud-based GIS platform that houses and queries all of the data layers on the Geoweb. Carto was utilized because it is a powerful and flexible platform that is easy to use. 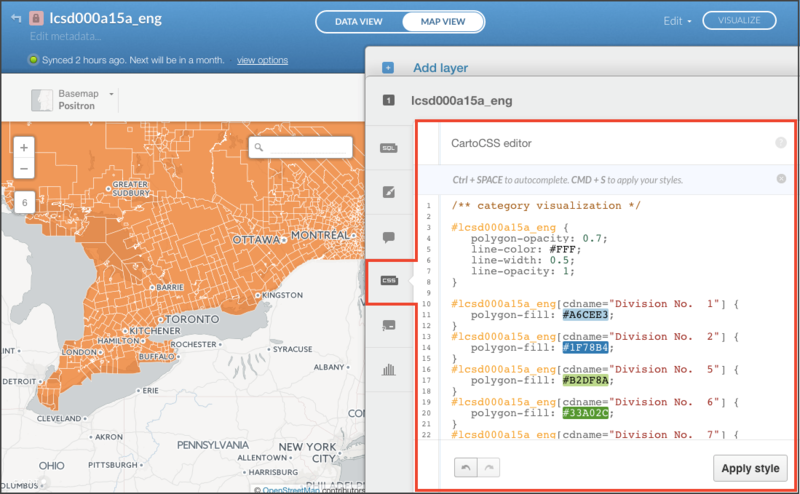 For example, Carto provides the ability to quickly manipulate data in the cloud using SQL and also visualize spatial data using either a user-friendly wizard interface or an advanced CartoCSS editor (see screenshot below). Further, Carto provides the Geoweb with the flexibility of using various data types and the ability to seamlessly interact with other platforms such as Leaflet, MapBox, and OpenStreetMaps. These additional platforms enhance the overall functionality of the Geoweb. Carto offers these and many other benefits to the Geoweb while maintaining an overall ease of use that doesn’t always require a GIS professional. Second, the administrative interface of the Neptis Geoweb was custom-built by Carto developers, to organize and maintain map layers and other non-spatial content. Neptis staff are able to prepare, organize and maintain content such as map layers, municipal data profiles, and short topic stories. When dealing with large quantities of raw data and map layers, it is essential to have a way of managing content. 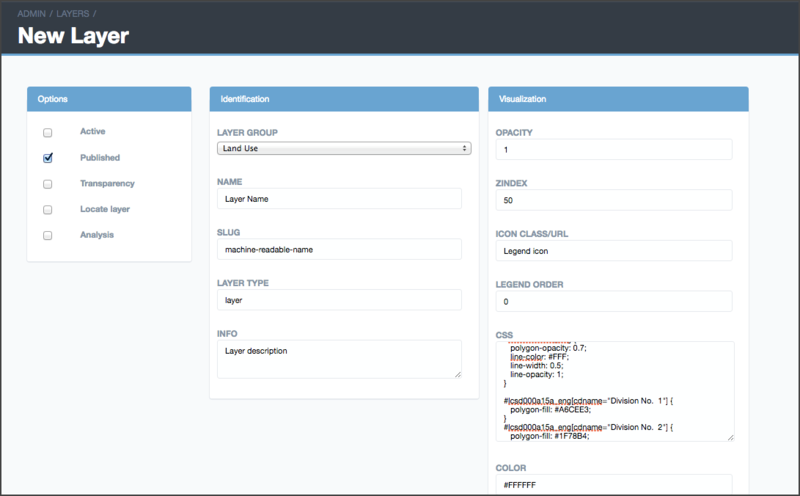 The admin interface contains simple forms that make up the content shown on the Neptis Geoweb. The screenshot below shows part of the form that is required when creating and updating map layers. This is a brief introduction to the Neptis Geoweb and the two main components that make it an efficient platform. Like Carto and web mapping as a whole, the Neptis Geoweb is an evolving project. As more data becomes available – whether relating to local areas, the region or beyond, the intent is to continue to enrich the Geoweb.